The United States of America (USA) is a federal constitutional republic made up of 50 states (48 continental states, plus Alaska and Hawaii the two newest states) and one federal district - Washington, D.C., the capital district. The country is situated in the central southern part of North America almost entirely in the western hemisphere. The USA is washed by the Atlantic Ocean in the east and by the Pacific Ocean in the west. The mainland United States borders Canada to the north and Mexico to the south. 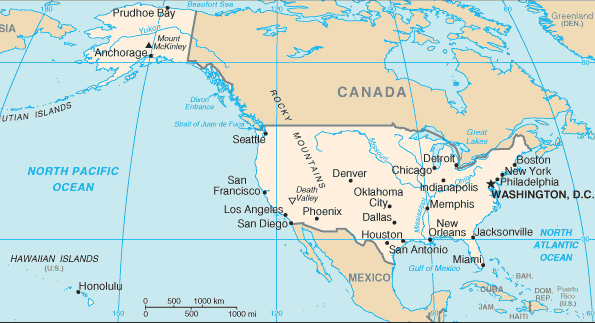 The state of Alaska is in the northwest of the continent with Canada to its east, and the state of Hawaii is in the mid-Pacific. The largest state is Alaska, the smallest - Rhode Island. Apart from the political states of the USA, the country also has territories outside which are "insular areas". Some of these are U.S. Virgin Islands, American Samoa and Northern Mariana Islands. The Commonwealth of Puerto Rico, in the Caribbean, is a dependent of the USA but retains commonwealth status. The place where is now the United States has been inhabited since prehistoric times by Native American tribes called Indians. The first attempts to found a colony in North America were made by European gentlemen adventurers. Native Americans suffered greatly from the influx of Europeans. The transfer of land from Indian to European -- and later American -- hands was accomplished through treaties, wars, and coercion, with Indians constantly giving way as the newcomers moved west. The first successful English colony was founded at Jamestown, Virginia, in 1607. In 1620, English Puritans (Pilgrims), who were non-conformists or dissenters from the Church of England, founded Plymouth Colony in what later became Massachusetts. By 1733, English settlers had founded 13 colonies along the Atlantic Coast, from New Hampshire to Georgia. Colonists arrived from other European countries, but the English were better established. On July 4, 1776 thirteen colonies of Great Britain declared the independence of a nation called "the United States of America" in the Declaration of Independence, primarily authored by Thomas Jefferson. George Washington - a renowned hero of the American Revolutionary War - became the first President of the United States under the new U.S. Constitution. The nation's birthday is celebrated on the 4th July. During the 19th and 20th centuries, 37 new states were added to the original 13 as the nation expanded across the North American continent and acquired a number of overseas possessions. The two most traumatic experiences in the nation's history were the Civil War (1861-65) and the Great Depression of the 1930s. There are many symbols that represent the United States of America. Some of the most popular ones are the US flag (nicknames for the flag include “The Stars and Stripes“ or "Old Glory"), the Statue of Liberty (the Statue is in New York on Liberty Island and it is a gift from France), the bald eagle (the national bird), the Lincoln Memorial, the White House, the US Capitol, the Washington Monument, the Liberty Bell, and many others. The American flag consists of 13 equal horizontal stripes (seven red and six white stripes). There is one stripe for each of the first thirteen colonies of the United States. As there are fifty states in the United States, there are fifty stars on the American flag: one star for each state. Out of many, one (E pluribus unum, sur le Grand Sceau). The National Floral Emblem of the United States of America: The Rose.